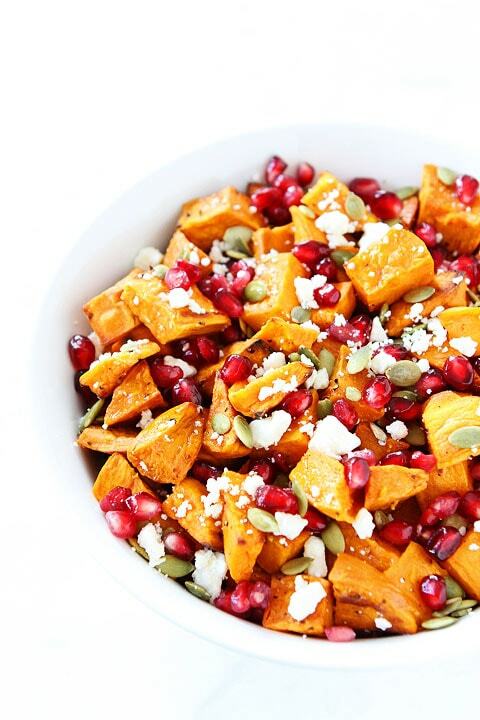 Sweet Potato Pomegranate Salad with feta cheese, pepitas, and a light pomegranate dressing. Serve this healthy dish at your holiday meal! I think I am turning orange. Not because I am going to the tanning booth, but because I am eating A LOT of sweet potatoes. 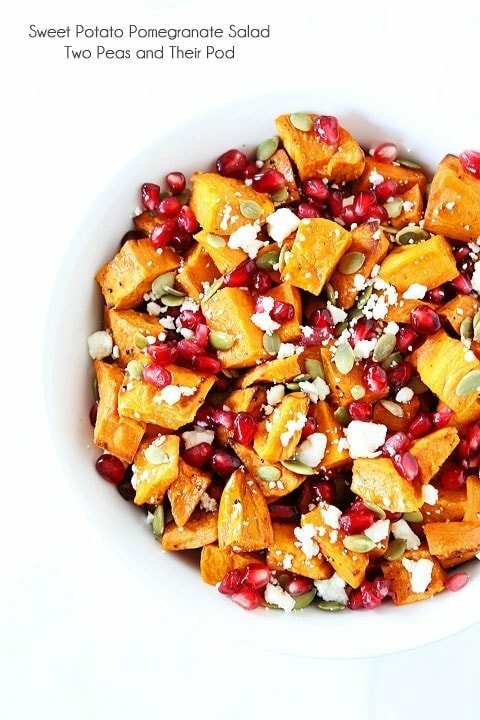 I am addicted to this Sweet Potato Pomegranate Salad. I made it once and devoured it, so I made it again…and again!I think my skin is starting to have a slight orange tint to it. I don’t care because I can’t stop eating this salad. It is so good! And at least my orange tint is from a healthy salad and not a tanning bed. I tried the tanning thing in high school and it was not a good idea. Not only is it bad for your health, but I was allergic. I broke out in a rash every time and would cry for a day because it felt like someone was stabbing me with needles. Did I keep tanning? Yes! I didn’t want to look “bad” in my cheerleading uniform or prom dress. Don’t worry, I wised up and stopped going! Oh, the things we do in high school. Live and learn. I am glad those days are behind me. Ok, let’s get down to business because you all need to make this salad. 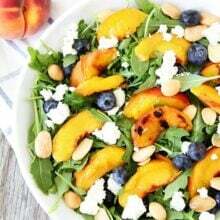 I love this salad because it is SO easy and so fresh! I start with roasted sweet potatoes which are pretty much my all time favorite food. Roasted sweet potatoes are better than candy if you ask me! Cut them into cubes, drizzle with olive oil, season with salt and pepper, and roast away! Sweet potato perfection! I am perfectly content eating roasted sweet potatoes right from the baking sheet. Some days, that is my dinner. I don’t need anything else, but I wanted to jazz up my sweet potatoes so I added pomegranate arils, pepitas, and feta cheese. I added a splash of pomegranate dressing to bring out the pomegranate flavor. I used pomegranate juice, red wine vinegar, honey, and olive oil. The dressing is nice and light and gives the salad a little boost of flavor! 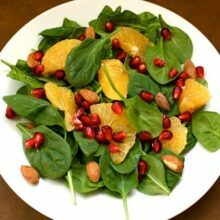 I love the pop of color and flavor the pomegranate, pepitas, and feta add to this salad. I am seriously addicted. I can’t stop making it! We’ve been eating it for lunch and dinner as our main meal, but it also is a great side dish to any meal. 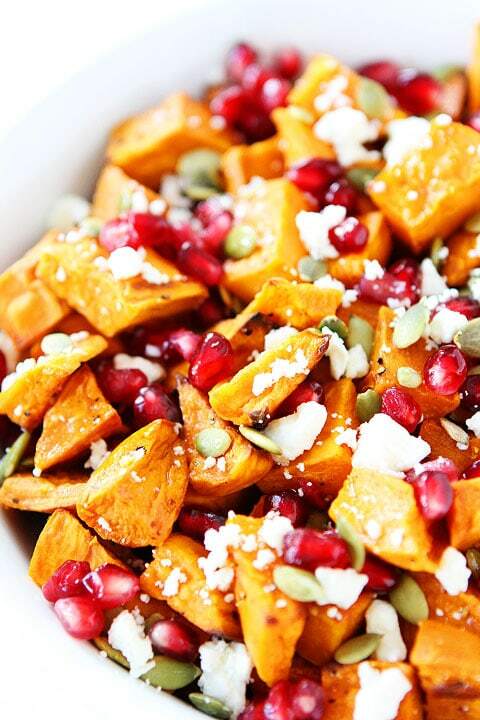 Sweet potato and pomegranate salad with feta cheese, pepitas, and a light pomegranate dressing. This salad is great as a side dish for any fall or holiday meal! 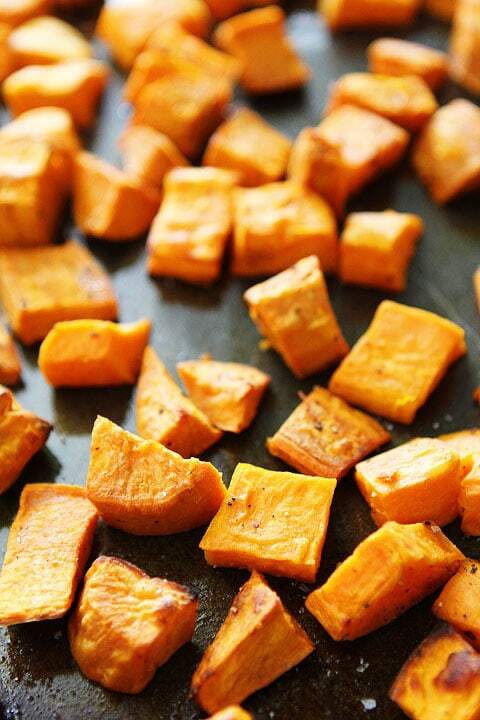 Preheat the oven to 400 degrees F. Place the sweet potatoes on a large baking sheet. Drizzle with olive oil and toss until sweet potatoes are well coated. Season with salt and pepper, to taste. Roast for 20-30 minutes, stirring occasionally, or until sweet potatoes are tender. Remove from oven. Place the sweet potatoes in a large bowl. Add pomegranate arils, pepitas, and feta cheese. In a small bowl, whisk together pomegranate juice, red wine vinegar, honey, olive oil, salt, and pepper. Drizzle dressing over sweet potato salad. Gently toss. Serve immediately. Yum! 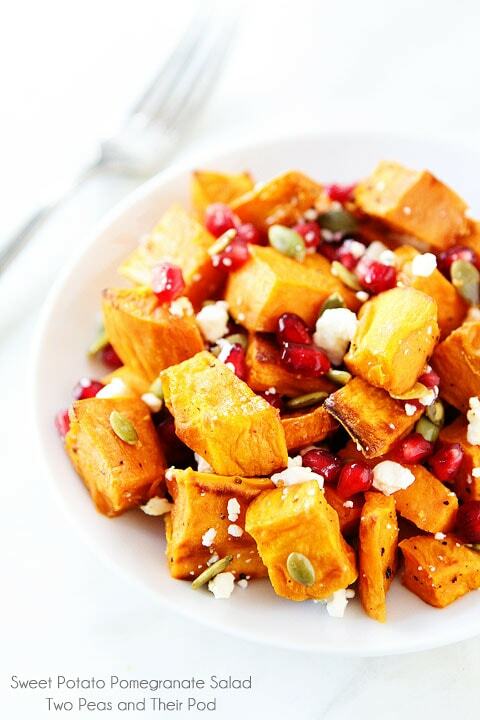 I love sweet potatoes and pomegranate together! What a great side dish, so perfect for Thanksgiving!! I am obsessed with these colors. Beautiful. This is so pretty, and looks healthy and delicious! This looks delicious! It would be a great dish for Thanksgiving! Beautiful colors!! I love dishes that look pretty and taste amazing – this is definitely one of those! I love sweet potatoes too. This is a great twist on traditional salad. I’ve never been tanning. I can’t believe you kept going even though you were allergic. The things we do to look good! I love sweet potatoes! I have never had them with pomegranate but it sounds like an amazing combo! Plus, it’s so freaking pretty. Yum! I think I am turning orange too! I simply cannot stop myself from taking down an entire baking sheet of sweet potatoes. They are my favorite Thanksgiving side, and I love your fresh twist! I’m almost embarrassed to say that I just tried pom seeds – they’re amazing! I’ve been looking for creative ways to use them ever since. I love the combination of flavors and colors here – it’s on my list! Oh man this is my kind of salad! Love all the textures and flavors! This is beautiful photography and it looks delicious! My baby had a slight orange tint after too much sweet potato that my pediatrician told me to lighten up 🙂 But I think we adult could use a little more orange! Thanks for the recipe. Ha! I love that you talked about tanning beds! This salad looks soooooo tasty. I love each of those ingredients! Oh man…I just used all of my pomegranate seeds to make pomegranate syrup. This is a good excuse to buy more. It really would be beautiful on any holiday table! Do u just Swallow??? The Pom. Seeds?? Or is everyone around the thanksgiving table spitting seeds??? ……Ugh??? You eat pomegranate seeds. That is the part you eat:) They are so good! Is this better when it is hot or warm? Gotta love the sweet potato and pomegranate this time of year! Looks delicious! I am in love with this salad! All ingredients that I love, combined in the best possible way. Thanks, Maria! holy wow, these colors are so vibrant and remind me of the leaves outside my window!! beautiful side dish! The colors are calling my name. Love everything about this! 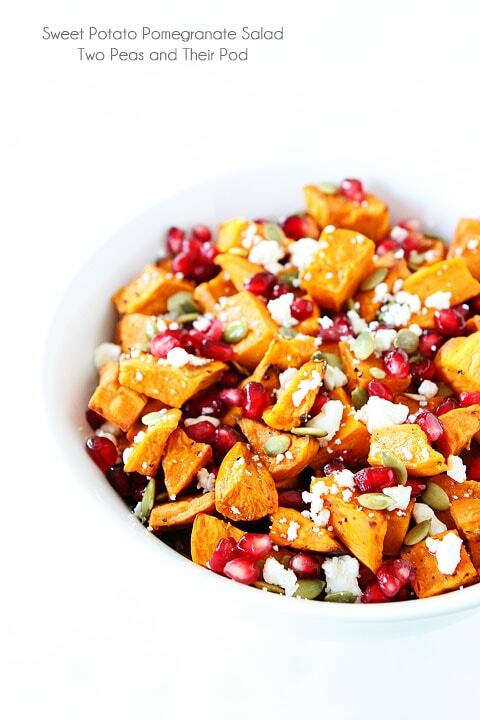 What a perfect sweet potato salad! Love!! This salad looks amazing! Perfect for fall and winter! I could eat this any time of day, so totally gorgeous! 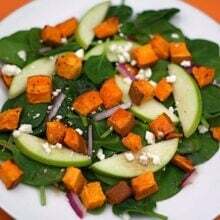 I love sweet potatoes any which way ~ this salad looks great! This is a gorgeous salad! Love the pom seeds for a pop of color! I am so excited to try this recipe! Slightly ecstatic, actually…I lucked out and found some reduced pomegranates at Kroger’s last week AND I just roasted some cubed sweet potatoes the other day. Hooray! Thanks for sharing another delicious recipe! If you have leftovers, do you eat it cold or do you just keep all the salad ingredients separate from the potatoes, heat the potatoes and then dress it as a salad again? Does that make sense? I’ve eaten the salad cold and I have put in the microwave for a bit to heat it up. It was good both ways! The colours of this salad is truly spectacular and the flavours sound amazing. This would be great too with goats cheese instead of the feta. Such a gorgeous dish! I may need to add this to our Thanksgiving menu! Stunning combination: looks beautiful and I bet that it tastes brilliant too! I made this last night for a side to our chicken and it was delicious…the boyfriend (who was skeptical at first) raved about it the rest of the night!! What a stunning salad, Maria! I love everything about it and will definitely be making it for one of our Holiday feasts or just a weeknight side dish! This is such a beautiful salad! I don’t cook but this looks amazing and I’m going to give it a try. Does the Feta melt if you put it in right away? Is it supposed to melt? I always wait to add the feta right before serving…so the potatoes are at room temperature. That way the feta doesn’t melt. If it did it wouldn’t be a bad thing though! It would still be tasty! I just needed to tell you that I made this to take to work for a week’s worth of lunches. Umm…it was so good that I didn’t save any for the next day! It was totally worth taking that pomegranate apart for the arils! DELISH! This looks absolutely fabulous! Love the colors. Oh my gosh, this is the best thing my eyes have seen all month. Thanks for sharing, I will have to make this asap. This looks amazing! Do you think this could be done with cranberries instead of the pomegranate? I have a extra bag of fresh cranberries I want to use up. Thanks!!! Do the pepitas need to be salted or raw? I have some raw seeds but am not sure if I should roast them a bit first… Can’t wait to make this for our TG feast!!! Thank you! You can use salted or raw. If you use raw, you might need to add more salt to the dish. If you use salted, use less salt. Enjoy! I’m making this right now! It is coming together beautifully. One question: is it supposed to be served warm, or can I put it all together now and refrigerate it for tomorrow? Otherwise, I’ll have to reheat the potatoes tomorrow and put the salad together just before dinner.. Thanks! First time here. Cant resist commenting when I saw these photos. Your photos and recipes are awesome. 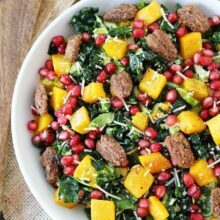 Loved this post and site..
looks delish!!! my question is? what are pepitas? This is amazing! I didn’t have the seeds, so I added pecans! Love it! This looks delicious and I’m planning on making it for my Christmas brunch. Can I roast the sweet potatoes ahead of time? If I serve as part of a holiday lunch salad bar, what other salads would be good to accompany? And can you make this ahead? Can I use goat cheese instead of feta ( not a feta fan)…Also, is it supposed to served warm or cold? This looks sooo delicious!! It’s Canada’s thanksgiving this weekend and thought it would be a perfect side dish. Do you serve this salad as a cold dish or warm?? Can’t wait to serve. I like this salad, especially the color. Not having any Red Wine Vinegar OR Pomegranate Juice, I substituted Pom. Vinegar & Cranberry Juice in the Dressing. Because of the Cranberry Juice, I decided to add some Dried Cranberries AND 1 peeled, seeded, & diced Cucumber ( Thought it needed a touch more green and didn’t want to put any lettuce under it. *G* ). It was abso~FREAKIN’~lutely DIVINE, especially with the sprinkling of finely chopped Pecans I tossed on top! Made this for dinner tonight. It was awesome! No leftovers! Can I prepare all in advance and just add the dressing before I serve? The first time I made this we served it as a cold salad. Huge hit! Tonight will try it warm with pork chops. Yum! Making this AGAIN. The colors & flavors are perfection. Try toasting the pepitas for a little extra crunch. 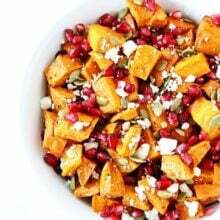 This recipe was a dream … easy to prepare and absolutely delicious with the crunch of the pomegranate and walnuts and the creaminess of the feta and sweet potato. The dressing added a final piquancy. I have had a bag of quinoa in my pantry for months. I had no motivation to do anything with it until I saw this recipe. I love that it cooks in one pan, without having to precook the quinoa. Thank you for the recipe! I will be making your Salmon with teriyaki and sriracha cream sauce tonight! Love your site! This salad looks nice and I love it so much. Thank for sharing. This salad is pretty and delicious! It has become one of my favorite ways to use pomegranate. One of my daughters takes it to potlucks because it always impresses–so colorful. I like to make it with different colors of sweet potato. FYI, if you sub balsamic vinegar for the red wine vinegar it tastes great but is not pretty. But subbing pomegranate molasses into the dressing works well if you have it. Encouraged by a pomegranate left over from New Years, I made the salad last night to accompany a dinner of steamed dumplings. An absolute winner! In addition to using a leftover, it introduced me to pomegranate juice, which I had read about but never purchased or used before. We’ll be making the salad and using its pomegranate ingredients again soon.